PHILADELPHIA (WPVI) -- The Philadelphia Eagles announced on Tuesday that the team has released tight end Brent Celek. Celek carried a 2018 cap charge of $5 million. The Eagles, about $9 million over the cap entering the day, have been working to get their finances in order before the start of the league year on Wednesday. They also restructured right tackle Lane Johnson's deal in a move that saves them an additional $7.5 million. An 11-year veteran, Celek was drafted by the Eagles in 2007 out of the University of Cincinnati and leaves Philadelphia with the fourth-most receptions in Eagles history (398). Celek, who missed just one regular-season game in his 11-year career with Philadelphia, ranks fourth in team history with 175 games played behind David Akers (188), Brian Dawkins (183) and Harold Carmichael (180). Prior to his release, he was the longest-tenured active professional athlete in Philadelphia. During his Eagles career, Celek totaled 398 catches for 4,998 yards and 31 touchdowns, marking the eighth-most receiving yards and 11th-most receiving touchdowns (tied) in Eagles history. He also played in nine postseason contests and added 27 catches for 257 yards and three touchdowns. In 2009, Celek recorded career highs in receptions (76), receiving yards (971) and receiving touchdowns (eight). His 971 receiving yards that season are the second-most by a tight end in Eagles history, trailing only Pete Retzlaff's 1,190 receiving yards in 1965. "Brent Celek defines what it means to be a Philadelphia Eagle. His dedication to his profession and this organization is unmatched and he will go down as one of the best tight ends in franchise history. Brent embodied the City of Philadelphia's temperament and character with his toughness and grit. 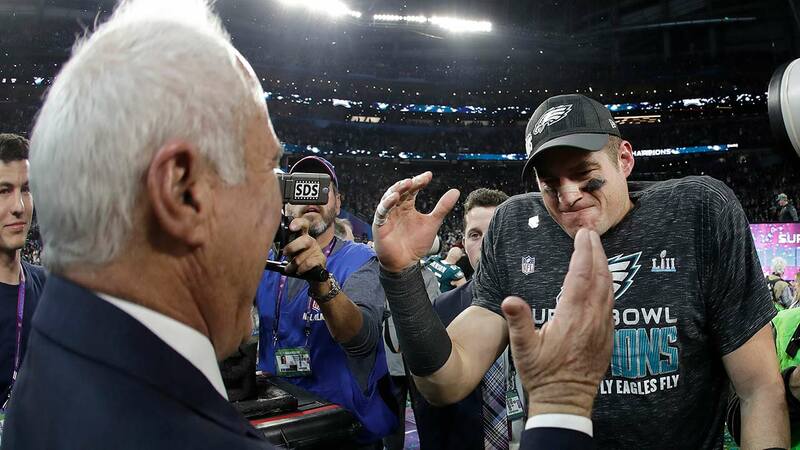 He has been a huge part of everything we have been building over the last decade and it is only fitting that he was able to help us win our first Super Bowl last season. Unfortunately, in this business we are forced to make difficult decisions, especially this time of the year. This one is as tough as they come, but in our eyes, Brent will always be an Eagle." Celek helped the Eagles reach two NFC Championship Games (2008 and 2017) and capture the first Super Bowl title in team history in Super Bowl LII.